England Women won by 2 wickets. Well, England got out of jail there. But it is two from two and they are second in the group. I'm off for a lie down. Join us again for the men's match between New Zealand and Pakistan in about 30 minutes time. England captain Charlotte Edwards on Sky Sports: "I've felt that nervous before but it doesn't get any easier watching the last few runs. The most important thing is we got a win here. "We play the West Indies here on Thursday so the luxury for us is we've played a game here and we will better prepared. "I thought we did well to break the back of that score in the first six overs but then it got away from us a bit." India captain Mithali Raj: "We are still in the competition. We hope to win against West Indies and we will rely on the result of the other matches. "We realised how difficult it wad to score on this pitch. A little more application from the bowlers in the initial overs could have pulled us through. But the bowling and fielding in the middle overs dragged us back into the game. "When you out there you are always planning, so you don't have time to feel the nerves." Player of the match Heather Knight: "I think we like to keep it interesting but we got over the line. "The pitch was a bit of a Bunsen burner. I tried to put it in the right place. It was nice to get a few wickets and contribute. "There was a lot of nervous tension, but it's rarely a quiet dugout with us. I was in the dressing room for a bit because I was too nervous watching - but the noise of the crowd was more nerve wracking so I had to come out." So, England move up to second in Group B, level on four points with West Indies, but with an inferior net run-rate. India are third, with their tournament hanging by a thread. They have played three matches and won just one of them. "The key was trying to go too hard at times from England. There were forced shots. I don't think England handled the left-armer particularly well today. It's two from two but there are areas to look at - including the catching." Hats off to India, they made a real game of that when all the smart money was against them. 91 is no total to defend, but they came mighty close. They got more than a helping hand from England along the way, of course. "England can just breathe easy. It was full of drama and twists. Well dione to India, their fought back with the ball and used the conditions. We could get into the detail with England but they did it and it gives them impetus to get through the group games." There it is! Shrubsole drives again and this time finds the gap. The ball skips away to rope and England, to their utter relief and delight, win. What a time to throw the ball to a new bowler. No pressure Veda Krishnamurthy. She almost makes a real impression as Shrubsole belts one straight at the fielder at cover but the catch is spilled. Everyone breathe again. Anya Shrubsole gets off the mark first ball and has to run like the wind to get home. Another run closer. Just three more needed. "England's running between the wickets has been shambolic. It was not needed. I'm not sure who had the call. She's short of the crease by around four or five inches. Crazy running between the wickets." What are England doing?! They need four runs to win! Four!!! Brunt cuts into the off side and sets off, giving Gunn no chance at the striker's end. The throw is good, the keeper whips off the bail. Gone. Ugh. 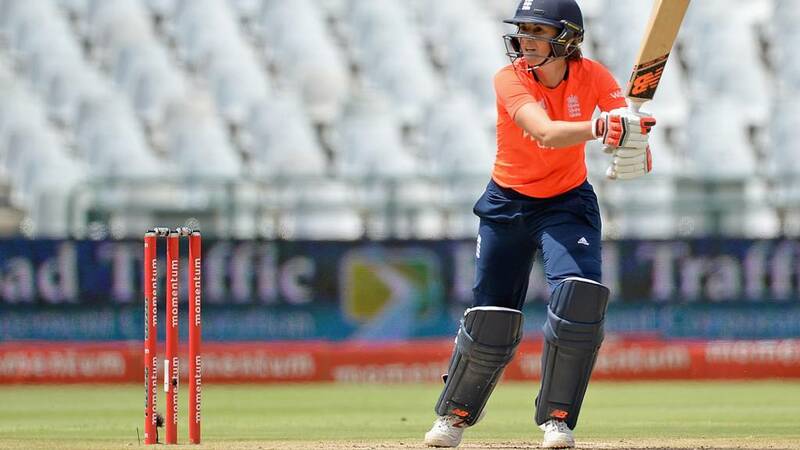 "You feel Jenny Gunn's boundary is the moment that has swung it back in England's favour. It was good from Jenny to make sure she got enough on it." That lbw shout from Jhulan Goswami against Brunt was hitting. Say it quietly, though. Every ball is drama now. Brunt pokes the ball to mid-off and sets off, with Jenny Gunn just making it home at the striker's end. Brunt then escapes an lbw shout before Gunn bottom edges a cut for four. That last ball has swung it right back in England's favour. A maiden. Repeat, a maiden, in the 16th over of a T20 match. That is the kind of pressure England are under right now. The England players on the bench were still smiling a few overs ago. They're not now. "That's just a complete gift. She was gone by absolute miles. That is a massive error from England because this game is not home and dry yet. "The key is how you handle the pressure and Danni Wyatt got a bit carried away with the moment." Wow! What a piece of fielding! But what was Danni Wyatt doing? She is at the non-striker's end and sets off for a run after Brunt punches the ball straight to Mithali at cover and is way short with her dive as the fielder throws down the stumps. Madness. This game is far from over.